Contact Sharon Sinclair Poetry Speaker & founder of Precious Gems Poetry Club for support and encouragement on life's journey. While employed as a primary teacher for the Toronto District School Board I decided to share my life-long love of poetry with the children at Albion Heights Junior-Middle School. As an extra-curricular initiative, the concept gave me a unique opportunity to make a contribution while enriching my own life in ways I never imagined. The joy of relating with the children in such a meaningful activity sustained me in a profession that seems to be increasingly burdened with stress. Initially, our club was called the “Poetry Appreciation League” or (P.A.L.). Usually I would share a little snack during the course of our meetings, until a new idea came to me following another enterprise. Having worked with colleagues on the Precious Gems concept that I had evolved as a motivational strategy, it occurred to me that the little glass gems we were collecting as rewards had great potential as symbols for the poetry club. In time the gems became collector's items that seemed highly motivating for the club members. The gems not only helped the children to focus on elements of poetry, but even more importantly the gems signified to the children that each member of the group was, indeed, a precious gem! I produced a manual for teachers to help illustrate one method of teaching a seven-week program in poetry appreciation. Occasionally I would be invited to attend in-service sessions where I had the pleasure of describing the club to other teachers. The picture of the sign you will see here was taken at one such event. Our club meetings were lively, exciting times complete with candles and a ceremony that recognizes the passions that inspire poetry, honours the wisdom of past poets and encourages present and future poets to leave their legacy enshrined in words. 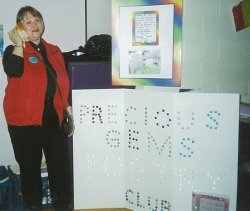 As our reputation as poets began to spread, The Precious Gems Poetry Club was given opportunities to perform some of my original poetry at various school and board-wide functions. Please return to this site often and watch for examples of some performance pieces as well as samples of children’s original work. Currently my manual is being re-printed in a revised edition and will soon be available for purchase through my website. My poetry CD for children (to be titled “Bubbles of Joy”) is in production. Following my retirement I had the opportunity to work in the library system by conducting summer sessions at The Ruth Hargrave Memorial Library in Dundalk, Ontario, located in the Municipality of Southgate. Our program always culminated with the production of an anthology of original work. I’ll be sharing some of these wonderful creations from time to time as my website continues to grow. I look forward to expanding the poetry club to include poets of all ages who appreciate the power of language to enrich our lives. I originally described the Poetry Appreciation League as a group of kindred spirits for whom words are a master key opening an imaginary world of infinite possibilities and revealing our everyday reality to be a treasure whose wealth we are only beginning to understand. Let’s start a network of poets to support and encourage each other on Life’s journey. Please contact me at for more information. I look forward to a long association with you as the road ahead bends and twists with the tides of time. Where will you go when your life fades away? Can you sense things around you? Do you feel the wind flow as you gently sway? Is your life one of silence? Or do you speak to the breeze? Oh, how I wish I could understand trees. of The Precious Gems Poetry Club. or was it by Divine intervention? !